The average student debt in 2017 is $37,172 while the total U.S. student debt stands at $1.4 trillion. In what only can be described as crazy, Americans are paying $38 to collect $1 of student debt. As we immersed ourselves in the student debt literature, it became clear that our book inaugurates student loan debt as a “neoliberal” crisis in U.S. higher education. This crisis did not come to be because a certain dollar amount of debt was reached and/or because student debt has surpassed credit card debt and is looming as the next asset bubble. Rather, college debt has been a problem since the 1970s and 1980s, coinciding with the birth of neoliberalism in the United States and the 1972 creation of recently privatized Sallie Mae. Lawrence Gladieux’s edited Radical Reform or Incremental Change? Student Loan Policy Alternatives for the Federal Government identified the escalating numbers of students becoming entrapped in debt already during the 1970s. In that book he wrote, “No federal policy ever decreed that students and families should rely increasingly on debt to finance college costs in the 1980s. The reliance on debt grew, beginning in the late 1970s, from a confluence of legislative amendments and market conditions” (p. 1) that, we argue, arise from the inherent logic or force that drives capitalism itself—namely private-interest-driven debt-based money. Only recently have scholars such as Best and Best, Collinge, and Johannsen argued that there is a student debt crisis, and that it is a neoliberal scam or at least resultant from a flaw inherent in neoliberalism itself. Question: What’s the contractionary economic impact of student debt on the US economy? Dr. Hartlep: The entrenched human capitalistic belief that greater investments (funded by loans) will yield greater returns (higher resultant salaries and economic status after graduation) fuels their behavior. Yet borrowing is no simple task. A preponderance of research indicates that the student loan industry is overly complicated and confusing for borrowers. Students lose track of the amount of debt they are accumulating. Student debt is different from other forms of debt because it is not dischargeable, even in bankruptcy or death. Meanwhile, according to the National Employment Law Center (2014), “Today, there are nearly two million fewer jobs in mid- and higher-wage industries than there were before the recession took hold, while there are 1.85 million more jobs in lower-wage industries” (p. 2). Students who accumulate student debt are Ninjas—they have No Income and No Jobs or Assets. Question: Who are the groups in the 1% that profit from student debt? What’s their relationship with the government? The American student loan system is an exemplar of unchecked neoliberal policy gone horribly awry. When Richard Nixon created the Student Loan Marketing Association in 1972, the proposition was simple: encourage private banks to make student loans by making it more profitable and risk-free for them to do so. Over time, however, the profit potential was strong enough that, by the 1990s, there was pressure on the government to take back the power to issue federal student loans and issue them directly, as it had done at first (1958–1965). With the writing on the wall, the managing executives of Sallie Mae compelled the board to push through a transition for the company from a quasi-governmental entity to a wholly for-profit enterprise. As Sallie Mae’s transition to being two private corporations was underway, executives at the company wasted no time in leveraging the company’s overwhelming clout on Capitol Hill to push through amendments to the Higher Education Act (HEA) that essentially removed standard consumer protections (mentioned above) that exist for every other type of loan. By 1998, these were signed into law, and the now-private Sallie Mae was in an overwhelmingly strong position. Not only was it lending something like 40% of all student loans in the country; the federal government guaranteed these loans while the company was paid 99%—100% of the book value of loans that defaulted. Question: What are some of the alternatives to tuition and debt relief that you propose and can you elaborate a little? 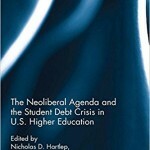 Dr. Hartlep: We organized this book around a topic—student loan debt—that no previously published text connected explicitly with neoliberalism. Initially, we planned to document alternatives to the neoliberal model of higher education financing. But, even in the face of the scathing critiques and staggering student debt statistics we cite in the volume, very little of the existing research is non-neoliberal. That is, much of the research on the student debt problem is ironically undergirded by neoliberal moorings and assumptions. As we immersed ourselves in the student debt literature, it became clear that our book inaugurates student loan debt as a “neoliberal” crisis in U.S. higher education. We share scholarship that documents how neoliberalism has a negative impact on higher education and students. The major way is that it has altered the reason people attend college in the first place. In times past, individuals attended college to learn for learning’s sake. The motivation was intrinsic and intertwined with the idea of becoming a more informed, well rounded person through the liberal arts. However, neoliberalism has altered motivations toward the extrinsic, or the economic. Purchase the Hardcover or Kindle version for more on the alternatives.